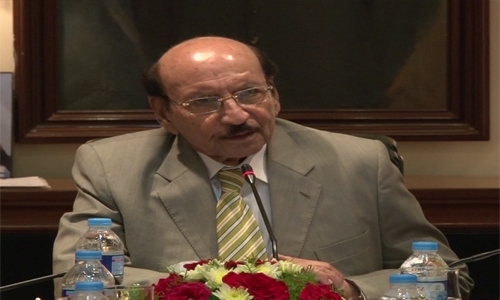 KARACHI (92 News) – Following the Rangers report revealing massive corruption in the metropolitan, Sindh Chief Minister Syed Qaim Ali Shah formed on Saturday a special task force to look into funding to terror groups and other matters. As per reports, Justice (R) Ghulam Sarwar Korai will be head of the Task Force with two other members including the home secretary of Sindh. The force will look into various aspects of financial assistance to terror groups. The force will also determine the elements involved in terror funding. Earlier, Sindh Rangers DG Major General Bilal Akbar told the Sindh Apex Committee that millions of rupees are being used for funding to terrorist groups. The illegal money also being distributed amongst gang-war factions in Karachi. He revealed that over Rs.230 billion is collected illegally annually. The briefing went on to say that this money is also used for the purchase of arms and ammunition.